Some of our battles were hard-fought; some of them were total blowouts. One or two really surprised me, honestly. Some I’m kind of sad about. But that’s how it works, right? Our biggest upset was #12 Smoky, who unseated #5 Sleipnir, but #10 Brego also beat out #7 Merrylegs. Just goes to show that nothing is guaranteed! Here’s what our bracket will look like for Round 2. Check your email, Erin – and if you have a blog, let me know so I can link to it! 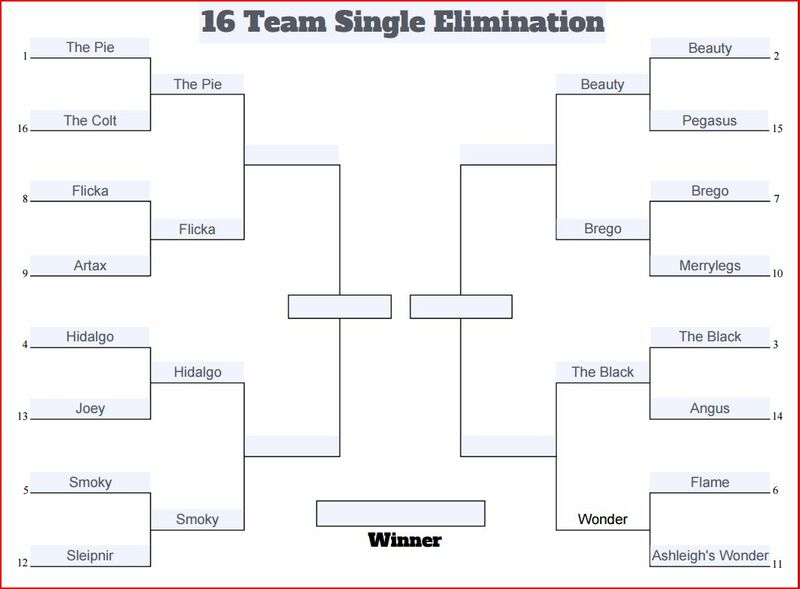 Round 2 will start tomorrow, with the Pie facing off against Flicka. There are no easy matches in this round, and I’m honestly no longer sure who’s going to advance. Stay tuned! Whoah! Thank you so much! I'm so thrilled and excited! The next rounds are going to be tough!